Cover artwork: Australian Aboriginal painting. Aaron Jay Kernis remains one of America's most distinguished composers, his works performed and commissioned worldwide. 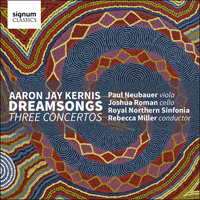 This new recording presents Dreamsongs—a cello concerto in all but name—alongside his 2014 viola concerto and the Bach-inspired Concerto with echoes for orchestra. This new concerto for Viola is inspired essentially by its extraordinary soloist whose playing I’ve known over many years. Paul Neubauer and I first worked together in 1993 when American Public Radio commissioned my Still Movement with Hymn for piano quartet which he premiered on air and toured with three other remarkable musicians. In some ways this new concerto follows up on the tone of that piece. More recently I was extremely moved by Paul’s recording (with pianist Anne-Marie McDermott) of viola music of Robert Schumann, and this lead me to re-explore the music of Robert and Clara Schumann in depth once again. I have always been drawn to the soulful character of the viola, and have been excited to write this work from the moment Paul requested it. This concerto shows many contradictory elements in tone, and the use of a very wide terrain of musical language and moods. The profiles of the melodies that suffuse it are highly varied, as are the wide contrasts of lyricism and harshness. Yet throughout there are linked musical ideas in each movement which give the entire work continuity. The opening movement, 'Braid', is a series of elaborations and embellishments of a sequence of harmonies and melodies. Throughout its compact length it shifts from clear three-note chords at the opening and closing to a thickening gauze of colors that weave around the viola line and lead, at its peak, to a chaotic frenzy. The second movement, 'Romance', is a lyrical, romantic intermezzo, which grows out of breathing, fluid gestures and harmonies that link to the Brahms/early Schoenberg tradition. The title came from discovering a number of lovely piano pieces by Clara Schumann titled Romanze, clearly written in mind of her husband. The final movement, 'A song my mother taught me', is the longest and darkest in the concerto, lasting about 20 minutes. Knowing of the Paul Neubauer’s interest in folk music, as soon as I decided to write the work I chose to base this movement on the well-known Yiddish song, Tumbalalaika, which I had first learned in my childhood. I had always felt it had very penetrating words and a sad melody, and was later surprised to hear it sung in many ways—as a romantic wedding song, wildly gyrating dance tune, and even in an ironic, comedic rendition. After hearing Paul’s Schumann CD, a melody from his Op 34 set of short piano pieces lodged in my ear and would not leave it, so its melody and distinctive rhythm became the frame of the movement, with Tumbalalaika as its essential musical material. Both melodies have a strong rhythmic kinship with the other. Included as bonus tracks (9,10) are recordings of the essential musical material used in the 3rd movement—my arrangement of Tumbalalaika for viola and piano, and the Schumann 'Fughetta', No 4 of the Op 32 Piano Pieces. The third movement begins with plaintive, virtuosic lines in the clarinet and bass clarinet, then the Schumann melody is heard in its simplest form. It returns repeatedly at important moments throughout, and is increasingly deconstructed and harmonically decayed. The use of the Yiddish tune takes the opposite approach—while it is formed like a theme and series of variations, the ten linked variations proceed backwards toward the tune, starting at their most fragmented and least melodic. The tune has been pulverized, made wildly improvisatory, and at times, very harsh and bitter. Only very late in the movement is the simple, original tune heard, above pulsating strummed chords. The form could be construed to be variations in search of their melody. A short, intense solo viola cadenza is followed by a dense and frenzied climax with the two clarinets leading the way. A decisively bleak battle between bass drum and viola pounds the opening Schumann-esque rhythms into silence. To close, the ghostly irony of a brief quote from Mahler, a final blanket of opposing chords that reference the Schumann one last time, and a pensive coda completes the work. Viola Concerto was written in 2013- 2014 and generously commissioned for Paul Neubauer by the Saint Paul Chamber Orchestra with the leadership support of Linda and Stuart Nelson; Idyllwild Arts Academy; Chautauqua Institution; and the Los Angeles Chamber Orchestra. It is dedicated to Paul Neubauer, in great admiration and appreciation. The essential element in the Sixth Brandenburg Concerto that inspired this work comes from its very first measure—the opening passage with two spiraling solo violas, like identical twins following each other breathlessly through a hall of mirrors—the echoing of the title. Also in mind were other works of Bach’s that I think of constantly, such as the Ricercar, keyboard Toccatas, C Minor Organ Passacaglia, etc. But it also echoes other recent work of mine and reminiscences of other composers I love who also paid homage to Bach in their music. Each of the Brandenburgs is exceptional in its use of instruments, and this concerto mirrors the Sixth by using only violas, celli and basses, while gradually adding reeds and horns to loop back to the sound world of the First Brandenburg Concerto (and extending it with trumpet and percussion). The first movement begins with a soft introduction which lays out important building blocks of the concerto’s harmony, followed by a fiery, toccata-like virtuosic display. The lines in the movement are constantly mirrored and layered in an often dense maze of sound. The heart of the piece, the slow movement, is essentially a Passacaglia built on slowly moving bass lines, mirrored layers of melody and open harmonic spaces. Strongly consonant in nature, its harmonies are built in imitative spirals, while the more angular climax uses compressions of the work’s opening harmonies. Rather than closing with a faster dance movement, the brief, slow Aria suggests a courtly dance, and is expressive and pensive, ending with a sigh rather than a flourish. Concerto with echoes was written in the spring and summer of 2009 and was commissioned for Orpheus for the New Brandenburg project.